Amidst a vast panorama of vibrant colours, dazzling lights and scintillating music, CRPF School, Dwarka with great enthusiasm and reverence celebrated its 9th Annual Day on 7th October, 2015. An exotic and enthralling exhibition on Magical World of Harry Potter, animated world of Alice in wonderland and singhasan battisi presenting 32 social issue like terrorisiom, gender bias, women empowerment was out on display showcasing the efforts of the students which became the centre of attraction was appreciated by all. The students displayed the projects and models prepared by them as a part of their Formative Assessment project. A long awaited day commenced with the ceremonial lighting of the traditional lamp by the Guest of Honour for the evening Hon’ble Director General, CRPF, Shri Prakash Mishra, IPS along with other dignitaries to invoked the blessings of goddess Saraswati. The school grounds reverberated with the chanting of the ‘Shloka Gayan.’ The auditorium was vibrating with the energy . The effort was made to reflect and justify the theme of the day . The school orchestra showcased their talent in a well-synchronised. 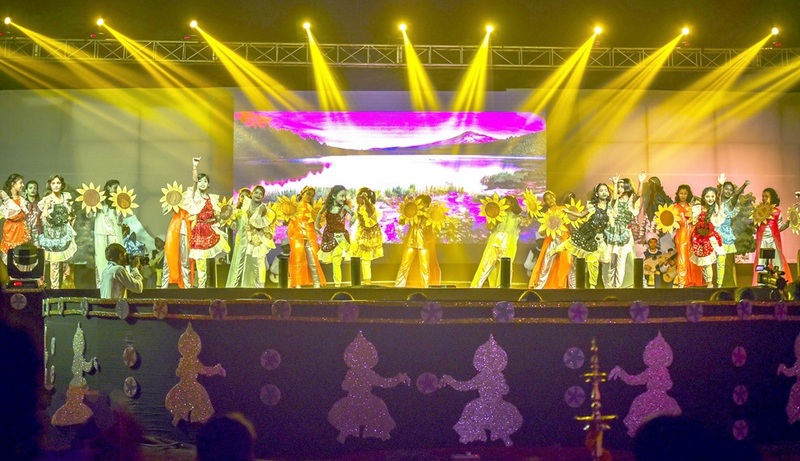 A musical rendition of the “Swagatam” by the school choir was well-appreciated by the audience.The highlights of the evening were “Junior Ballet – Alice In Wonderland” and “Senior Ballet- Anubhutiaan- ‘Ek Utsav” which made the audience spellbound. The great moments of the Prize Distribution Ceremony witnessed the meritorious students’ excellence in academics, science, sports, music and art and a befitting round of applause. . The Chief Guest for the day urged the students to “observe, visualise, analyse, and critically examine their surroundings and make a meaningful contribution to the nation.” He applauded the students for putting up a splendid show and for their team work, determination and efforts that ensured that the show was a grand success. The espousal words from Chief Guest along with the release of School Magazine “Uday” concluded the cultural saga with National Anthem. Parents of the students who were present for the celebrations were indeed beaming with pride as their children were part of an institution which is destined to be one among the top ranking schools in India today.